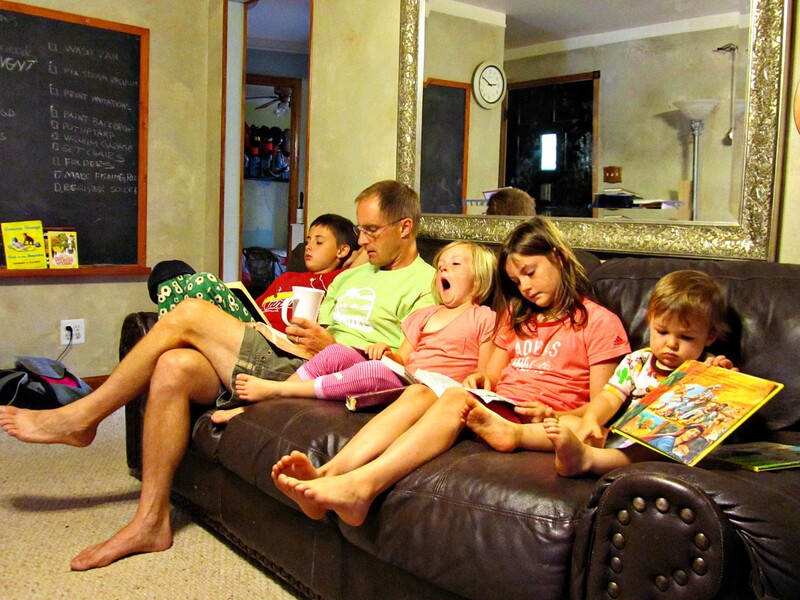 This photo was taken during our regular family Bible reading just a few mornings ago. We try to have one each morning after breakfast. Sometimes we only get through a few verses, and sometimes we aren’t so rushed. This photo made me laugh. Check out the faces of each one of the kiddos. Some mornings the kids don’t seem to get too much from the Bible reading. This happened to us just a few days ago while on our way to the Farm. I decided to head down to my family’s farm since my brother had a new baby and a birthday all in the same week. I decided Friday at noon, and by 8:00 the next morning we were on the road heading south. Since my Hunni was working, I was at the wheel for the 8-9 hours that it takes to get down to Southern Illinois. This meant that I couldn’t very well read from the Bible. LBG (Little Big Guy) read some verses and then asked some questions. Nobody had been listening, so I told him to read the verses again. This time we all tuned in, and this is what he read. . . I explained to the kiddos that this “box of ointment” was her saving’s account–her stocks and bonds, her 401K, her investments. So why do I save money? The first reason that comes to mind is SECURITY! Security that when I am old and can’t work, I will still be able to pay my bills. Security that if the car breaks down we can buy a new part and I won’t have to hitchhike. Security is important to me. The second main reason we save money has to do more with our DREAMS. Dreams of a better house. Dreams of vacations with the kiddos. Dreams. Dreams are often what keeps me focused forward. Sometimes the Hunni and I sit down for a cup of coffee with dreams and sugar. We talk about where we are headed (or wish we were headed.) I enjoy these talks. I guess I would have to say that the third main reason this family tries to save is for LEISURE. It would be nice to get to relax a bit more–not have to worry about every purchase. Instead of always just “making-do” to be able to splurge sometimes. So when the woman broke her alabaster box filled with all her life savings, she was “anointing the LORD for HIS burial–i.e. worship”, and she showed it by giving up her SECURITY, DREAMS, and LEISURE. I don’t know what opportunities for women to work was like in those days, but I am sure that replacing her gift wouldn’t have been an easy thing. 2 Responses to Sunday–Why Do I Save? Very thought provokeing!!! She “laid by her in store” for the Lord…. I don’t catch up on lots of blogs but just took a break at work and cruised over and read this post. It’s a wonderful thing to meditate on… Well said!